Canon classifies the Canon EF 400mm f/5.6L USM Lens as a "Super Telephoto" lens. It is super in image and build quality, but is not super in size. The 400 f/5.6 is relatively light in weight but very solidly built. It feels long and narrow in your hand - and feels even lighter than it is. This feel is most similar to the Canon EF 300mm f/4.0L IS USM Lens. The built-in slide-out lens hood is very convenient. A member of the Canon L Lens Series, the Canon EF 400mm f/5.6L USM Lens' overall optical and mechanical performance are excellent. The 400 f/5.6L internally focuses very fast and quietly thanks in part to a Ring USM (Ultrasonic Motor). FTM (Full Time Manual) focusing is featured and attached filters do not rotate. CA (Chromatic Aberration) is very well controlled. Color, saturation and contrast are excellent. Bokeh (background blur quality) is very nice thanks in part to an 8-blade aperture. Vignetting is very well controlled. Very minor pincushion distortion is present, but it will not be noticed in most (if any) of your images. What is missing in this lens, in my opinion, is IS (Image Stabilization). Handholding a 400mm f/5.6 lens requires lots of light, high ISO settings, and/or very steady arms. Many people use this lens this handheld without a problem, but I think adding IS would be a huge improvement in the 400 f/5.6 L. Using a sturdy tripod or monopod can resolve this problem. The 400 f/5.6 is a partially weather sealed lens. A lens mount gasket is not present, but the switches and focusing ring have moderate dust and moisture resistance. A front filter should be used for sealing purposes. The 400 f/5.6 is compatible with and performs very well with the Canon Extender EF 1.4x. Do note that autofocus will be lost on Canon non-pro bodies when using this combination. 1-Series bodies should retain AF capabilities, but only with the center AF point. The 1.4x adds barrel distortion, CA and some reduction in sharpness. The 400 f/5.6 is also compatible with the Canon Extender EF 2x. No Canon bodies will autofocus this 800mm f/11 combination and further degradation of image quality will be noticed. Expect a very dark viewfinder if using the 400 + 2x combo. A notable of minor importance is that the lens diameter at the 400's mount is slightly narrower than the extenders. When purchased from a reputable dealer, a tripod collar and nice padded Canon LZ1132 case are included in the box. The Canon EF 400mm f/5.6L USM Lens is popular for bird photography and especially birds in flight as it offers lots of reach for a reasonable cost in a relatively light package. Good vignetting performance helps keep even blue skies as they should be - evenly blue. Other uses include general wildlife photography and well-lit field sports. The Canon EF 70-200 f/2.8 IS L Lens (above left) is is shown beside the 400 f/5.6 L. The 70-200 IS has an optional Wimberley Lens Plate attached to the tripod collar. The big question is always - which lens should I buy/rent? 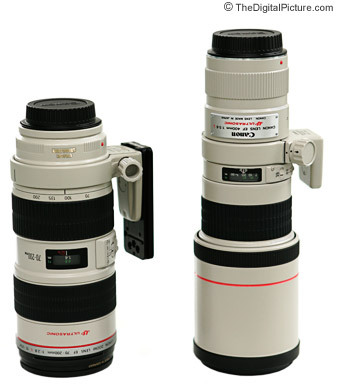 The Canon EF 300mm f/4L IS USM Lens plus the Canon Extender EF 1.4x (420mm f/5.6 IS), the Canon EF 100-400mm f/4.5-5.6L IS USM Lens or the Canon EF 400mm f/5.6L USM Lens? This is not an easy question to answer, but I'll attempt to give some suggestions. First, the Canon EF 100-400mm f/4.5-5.6L IS USM Lens wins the versatility category hands down. It is by far the most popular of the three lenses. It is very close in sharpness to the two primes when shot wide open at identical focal lengths and better than the 300 f/4 IS + 1.4x combo. It shows more distortion (pincushion) and more vignetting. The weights of these three comparable lenses and lens combinations are similar but the 100-400 will remove more weight from your wallet than the two primes. If you already own a Canon EF 70-200 f/2.8 IS L Lens, you might not need the 100-400's versatility as much. In this situation, one of the primes might make more sense for you. The Canon EF 300mm f/4L IS USM Lens wins for widest aperture and native (without 1.4x) smallest/lightest physical size. A big advantage over the 400 f/5.6 is the Canon EF 300mm f/4L IS USM Lens and Canon EF 100-400mm f/4.5-5.6L IS USM Lens' image stabilization. These two lenses also have the largest out-of-the-box magnification capability - .24x and .2x respectively vs. .12x for the 400 f/5.6 (delivered at the relatively long minimum focus distance of 11.5' / 3.5m). If you need the best 400mm image quality available in this price range, the Canon EF 400mm f/5.6L USM Lens is a great choice - it performs superbly. Give careful consideration to the Canon EF 100-400mm f/4.5-5.6L IS USM Lens and the Canon EF 70-300mm f/4-5.6L IS USM Lens before making your buy/rent decision.